I’m sorry to break down your walls of illusion but all mothers pale in comparison to mine. Not only is she the best mom since the dawn of man, but she is also a great person to bring along for a great fish dinner. We originally wanted to hit up a new Mexican joint down on Ventura Blvd, but it was closed so she suggested Lures after having been there a few weeks ago. Lure is your top of the line modern seafood restaurant. 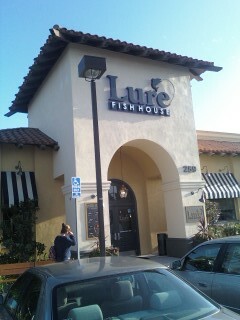 It’s got that steakhouse Outback, Wood Ranch kinda feel except with fish. It’s a huge place so it is perfect for your big party get-togethers, but a little more difficult for one on one dinners. Being that it’s large and open, its hard to hear who you are talking to and you pretty much hear everyone around you. Very clean, very modern, and very open. The staff are all very nice without being too Disney and our waiter was very customer service oriented. He was ready and willing to answer questions which with my mom is a must ’cause she has more questions than Trivial Pursuit (the deluxe edition that comes with 5 thousand more questions). The menu is simple and has plenty of dishes. There is a great variety of appetizers and entrees. They even list dishes that show which meals use fish that were not farmed or caught in mass fishery nets run by the man. at the beginning, the son feels like he should be sitting in the driver’s seat running the joint and the daughter has no business being there. It seems pretty much nobody wants the daughter there. Back with the Fast Food Round-up! We are back. After what I think has been almost a year, we are back. At least my half will be. Brian’s half will depend on Brian. He is a busy boy trying to help Obama get his budget approved and working on a cure for Voltronioliosis. It’s a disease affecting most middle aged guys who were big fan of the 80’s cartoon Voltron. Every now and then they attempt to call the lions, to form up Voltron, to fight the forces of evil. Most will contort into the shape of a lion and pretend to leave the volcano and join their brethren, yelling at the top of their lungs, ”And I’ll form the head!”. It’s never the Voltron that was formed by the cars and planes because that Voltron was just stupid. You’re either down with lion Voltron, or you may just be a communist. Anyway enough Voltron, lets get into some food. We will be doing some updates to the bios and such as both of us have undergone a few changes, mostly involving our places of residence or occupation. I finally found a way to organize the week in order to continue the quest to sort the garbage from the great food and to also watch our favorite TV shows. It will probably be mostly me for a little while, but B will chime in where he can. I’m starting our come back with a new blog I’m gonna call the Fast Food Round-up. I love trying the new things that these joints come out with. Always searching to top each other the Carls Jrs, Jack n the box, Taco Bells, and McDonalds of the world are always fighting it out with millions of marketing dollars. So a couple times a week, or as often as new things come out, I will try them out and maybe save you a trip to the white throne. As always here at EMC we are willing to take the fast food bullet for you cause well…….we love ya! Fast food very rarely goes the way of fish. The fillet o’ fish at McDonalds has been probably the one and only regular fish menu item from a straight fast food place. We are not talking about the fish fast food places that deal with fish. The long John Silvers and Sonics and any fish and chip fast food places aren’t included in what I’m putting together. I’m talking the big places like the golden arches, Wendy’s, Carls Jr, the Box, Taco Bell and Del Taco. For this particular round up we are talking shrimp and the recent shrimp tacos at Del Taco and Taco Bell. I’ve had both now and, as you probably guessed already, they are not great. The surprise though was that they were better than I thought they’d be. Would I buy them again? No. I think I’d rather be in charge of living arrangements for the homeless people in the Ventura river bed. Shrimp in itself, at least to me, is an easy ingredient to make fantastic. But if not done right, is also one of the most bland and flavorless of those that live underneath the depths. The great thing about the tacos at both DT and TB is that you can make them. Go to your local store, get a bag of those tiny frozen shrimp, thaw them, put them on a tortilla with some cheese cabbage and tomatoes and then stick the whole thing in the microwave. Fish is not meant to be a fast food. I know it, you know it, your mom knows it. Unfortunately nobody is telling the big-wigs or the small-wigs down at the big taco joints. These bland, limp tacos are being pushed on the public and all we can do is order something different. On a good note, I do really like that Taco Bell is getting crazy with the sauces. Their verde sauce is actually pretty good. I always get extra in case I make a quick quesadilla at home. It’s a great sauce. The fire roasted sauce is not all that great, but I like that they are trying. Sauce is everything in food, especially when your product is frozen then re-heated. The fight to make fast food healthy continues at Carls Jr where they introduced their very own Turkey burger. I understand the desire to make it healthy, but I think everyone needs to really ask what they are pushing. McDonalds has really been trying to push the healthy stuff too. Their oatmeal, which if you had it you’d know, might cause the president of McDonalds to be assassinated by the ghost of the Quaker. Serve apples instead of fries, have juice available, but beyond that you’re just asking for trouble. The turkey burger I had at Carls Jr was dryer than a Maytag. Maybe you’ve had a better one, but it was actually removing every bit of moisture from my mouth. The other weird thing was the flavor of the bun. It was odd. It was wheat, but not. It was kinda like it wanted to be wheat, so it dressed in a wheat shirt, but it tasted like wonder bread. I’m hoping it was just the Carls Jr I went to. I’m actually gonna try this one again because I wanna like it. As someone who is dropping weight, but on the run a lot, I want healthy alternatives. I’m just not sure its going to be from the star. More to come later this week as we review the start of Deadliest catch, get back into Kitchen Nightmares, and dig into some Man Vs food. Also we’ll have some new places to eat and we will see what B can give us from San Diego. It’s great to be back boys and girls. Where have you been eating? Send us some places you want us to check out! Kitchen Nightmares – Cho Me Some Respect! Hey guys and gals, EMC is back on track reviewing the best and worst food in Cali and the best and worst of the food shows on TV. B and I took a much needed break and are back in action, doing our part to inform, and make you giggle like a little school girl. So in honor of this great party holiday, I set off in search of some authentic Cajun food in the heart of San Diego. I’m happy to report that I found a spot that’s only 10 minutes or so from my house. Lucky me… you know how I love my spicy food. Gulf Coast Grill – On Park Blvd. between University and El Cajon. Exactly one year ago tonight, EatMeCalifornia came on the radar. It’s been a pretty good year overall, I think. But I can certainly understand the frustration that some of our readers have felt about the lack of content over the past few months. What I offer you tonight is not an excuse, but rather, an explanation. You see, over the past year, a lot has changed for Mikey and myself. I started law school (don’t ask me why) and Mikey has been doing his best to navigate the treacherous waters of single-fatherhood. While I can’t, and won’t speak for Mikey in this post, I want to assure you all that we still care about the site. We love food, we love you, and we have the exhausted bathroom scales to prove it. Hey Everyone sorry for such a long delay in posting. I’ve been busy teaching homeless people how to make funny signs to get food and Brian has been learning the law to aid in my upcoming criminal trial. To make a long story short I punched a guy in the neck for laughing at my meat sculpture of the Island from Lost. All of our content is still here and can be viewed. The newer stuff will pop in slowley as we get going again shortley.